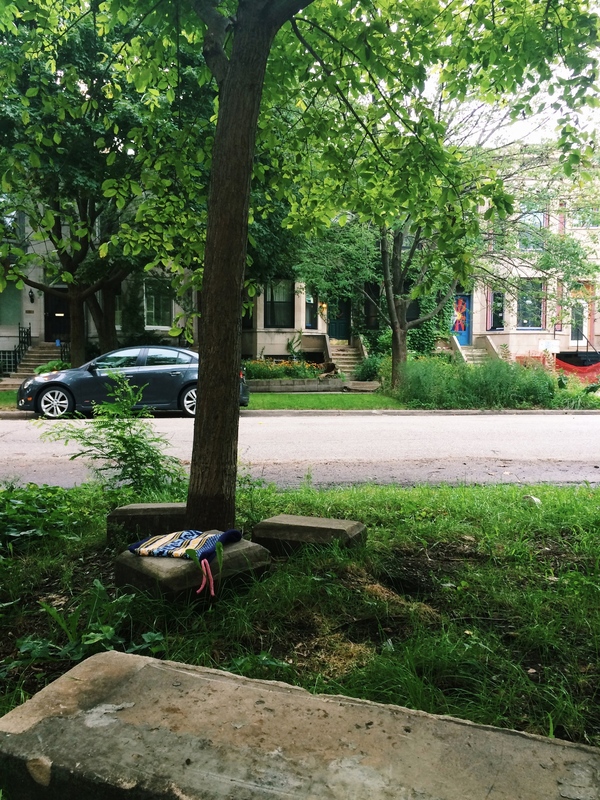 I feel like I need to explain why my knitting is draped over a cinder block on Ellis Avenue. As it turns out, my attendings and residents haven’t been the most understanding in allowing me adequate time off throughout the day to photograph my knitting (kniternity leave). We work straight through golden hour and it’s like no one even notices. It’s a little ridiculous. I wanted to say something (the only thing necessary for the triumph of evil is for good men to do nothing), but I’m learning to pick my battles. So, instead of carefully stylized photographs, I’ve started taking pictures of my knits on my morning walks to the hospital with my phone, and then filtering the hell out of them afterwards. I can’t even tell the difference (for real though please pick up after your pets it’s so annoying when people don’t and it takes like 10 seconds). In case there’s any confusion as to what exactly I’m parading around Hyde Park, this is a stethoscope bag, which is something I made up a week ago but which definitely needs to start being a thing. 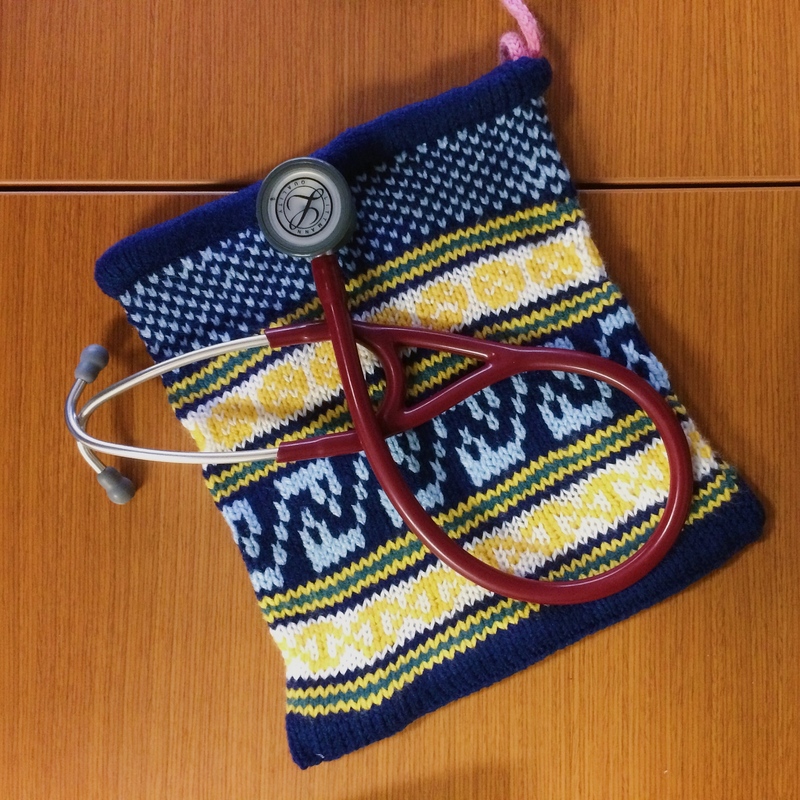 It’s a must-have for any budding physician, a way to keep their tool of the trade cozy warm and carried in style. Unanimously endorsed by the AMA (no) and J. Crew (i wish), it’s the perfect accessory to contrast that formless white coat. Also, it’s a great nidus for MRSA (murse-a). Complete with a hot pink drawstring and a questionable Brazilian color scheme, there is literally nothing like it. 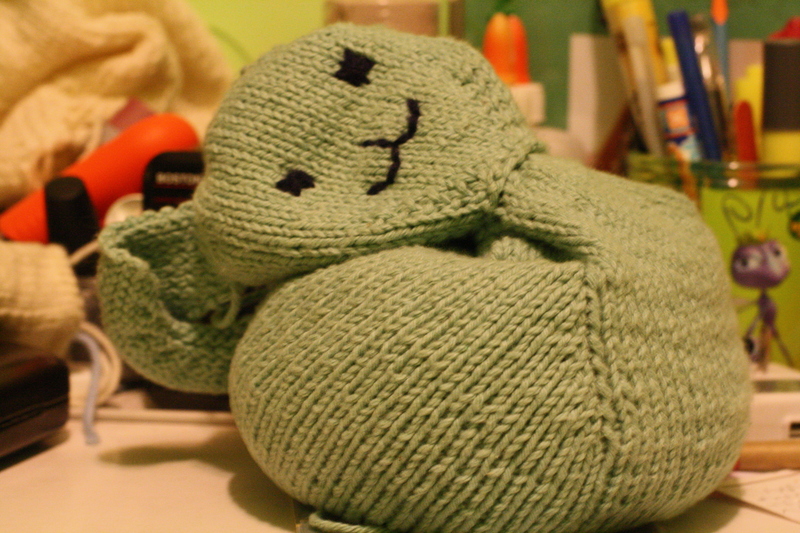 Except for this pattern, which I found on Ravelry that I used to make it. It has a great fair-isle design, and it used up the bits of leftover yarn I had laying around while also letting me feel productive for binge watching season 6 of Great British Bake Off (omg tamal hurry up and marry me already). 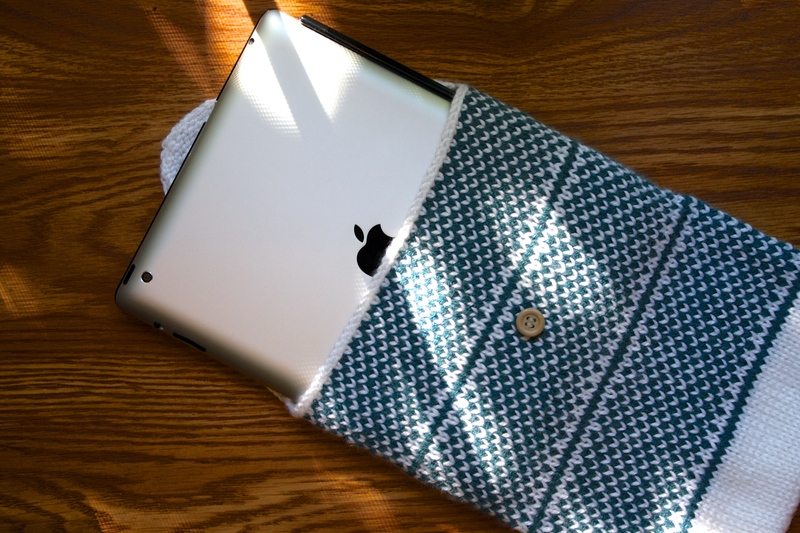 In truth, I was actually trying to make an iPad case, but I messed up real bad (cue: fail bunny from high school), so I made another one that was better, neater, and way less of an eye sore (iSore). I even included a J. Crew Admiral Blue 30/32 Driggs light weight chinos button to ensure maximum security. I also spent my day off (between great british bake off and more great british bake off) taking various photos of it in proper light. See people! This is what’s at stake! This! Now the reason I made this case is because I’ve started bringing my iPad with me wherever I go in an effort to get myself writing everyday. The plan was originally to record my thoughts day to day to help keep track of how I felt about my various rotations come time for residency. But what ended up happening was I reflected more on the thoughts of others than my own (#selflesspeopleproblems), and rather than day to day, I focused in on the minuscule–an hour or minute or even just a word–turning a single idea over and over in my head. I admit that seems a bit neurotic and obsessive (would you expect anything less coming from me? 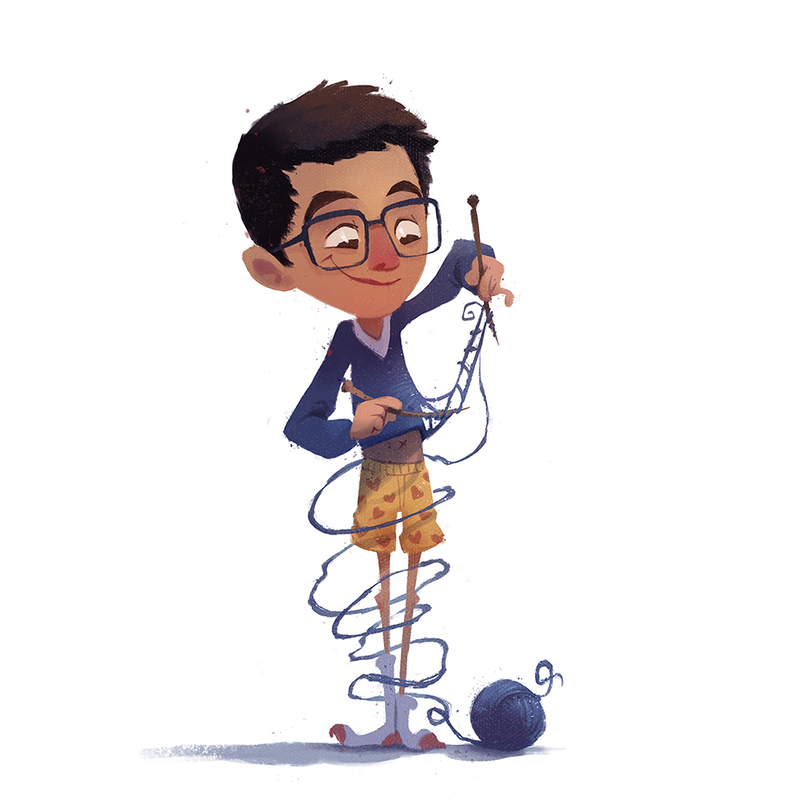 ), but regardless, here’s what came of it. ***The Great British Bake Off is currently on its 7th season and has won 2 National Television Awards, 2 BAFTAs, and a Rose d’Or. Oh yeah. Also, in case there’s any doubt: as irreverent as I am towards the personal space and privacy of others (i’ve joined already occupied revolving door quadrants on multiple occasions), there are some things, like HIPAA (and jed bartlet and deb’s parsley pecorino biscuits), that you just don’t mess with. She called me her alarm clock, which is funny in a cute kind of way—the kind of way to make you blush—a sort of pet name she had for me. If you didn’t know any better, you might think that we were together, and that I woke her up each morning with a quick peck on the forehead and the sandpaper tickling of my beard before leaving for work, the smell of fresh coffee finding her from the mug I left on the nightstand. Her alarm clock. But I only ever called her Ms. Roberts. I was rigidly formal. My way of keeping her at arm’s length. Though every now and again, I realized that there were only four years between us and, wasn’t it weird that I never called her by her first name? Not even once? I never even said it out loud. I wouldn’t. Not even if she insisted (which she never did). I wouldn’t dare. Just writing it seems almost too brazen. I knew everything about Ms. Roberts. I knew about her failed kidney transplant a couple of years ago, so she had three kidneys and none of them worked, which is kind of like having a car with five flat tires. She got dialysis three times a week like my grandmother used to, where they hooked her up to that huge, behemoth of a machine with wheels that spun her blood into loops, scrubbing it clean before letting it back into her body. She had open-heart surgery, too, with the metal wires around her sternum to prove it. They blazed on her X-ray and it caught me by surprise every time—like someone tore a hole right through the night sky. They were the same kind of wires that my father had in his chest, the ones he got after his triple bypass in ’06. She has an old soul, I’d joke to myself. Or maybe just a dying one. Here are the things Ms. Roberts knew about me. 1) She knew my name, a detail I consciously repeated every time I saw her. I just didn’t want her to forget me. I also didn’t want to put her in that awkward position where we’re in a conversation and then halfway through she realizes she doesn’t actually remember my name and you know how all that goes. 2) She knew that I had brown eyes, behind blue glasses, and that when I was concentrating I had a habit of looking down at my feet, as I often did while I listened to her heart or pressed on her stomach, feeling the contours of three idle kidneys collecting dust. And 3) she knew that it was my job to wake her up each morning. I knock on her door twice, upspeaking her name before easing my way into her room. She’s asleep, her legs tangled in blankets and hair wild in all directions, practically standing on end. Evidence of a restless night. I say her name again, a little louder, and lay a hand on her shoulder. She wakes up without ceremony and glares at me with naked annoyance. What now, she seems to ask. The lights are off, and her skin is pitch black, so the whites of her eyes are the brightest things in the room. We talk, or rather, I talk and she grunts or doesn’t grunt—I’m not quite sure which one means yes and which one means no—and at the same time I look around the room for clues. Her chair is still vacant and pristine, without a blanket tossed aside or tucked between cushions, no ghost of a vigilant friend, no overbearing mother churning restlessly, worried sick. There are some stray cracker crumbs and half a can of coke on her table, next to a Styrofoam cup filled with a greenish liquid. Her appetite is coming back, which is a good sign. I ask her to take a deep breath and she coughs in response. A serious cough, one that rings through her entire body like a bell. Her blankets stain green. I’m not sure if I could explain to you exactly how I met Ms. Roberts. And before you ask, it’s not a matter of egregious HIPAA violation or some irreducible medical jargon. I just wouldn’t know where to start. Her kidneys. Her lungs. Her heart. Take your pick. Working with her felt like running out of fingers while plugging the holes of a sinking ship. And we were up to our waist in water. She was just so sick, to the point where part of me couldn’t believe how easily she woke up each morning, that each night didn’t send her deep into the bowels of some impenetrable coma. The next day, I walk into her room and she’s sitting on the side of her bed, hunched over, while two men stand behind her taking turns sticking needles into her back. They aren’t giving her acupuncture, I can tell you that. These are terrifying needles. Gigantic, boring things that came straight out of a nightmare. More comparable to straws than anything else, considering what they’re trying to accomplish. So I stand there, half watching her clench her fists and half watching three inches of steel disappear into her back. I want to offer my hand for her to squeeze—that’s a thing people do, right?—but then I don’t, and then I do, and then all of a sudden I’m fourteen years old again with my brain buzzing out through my ears, and before I know it, the men are gone. A piece of gauze covers the left side of her back. They call me later that day to tell me it didn’t work. She’s still drowning. Maybe they’ll try again tomorrow. Maybe they’ll bring bigger needles. I stop by Ms. Roberts’ room to deliver the bad news, and I practice what I’m going to say a few times to her door like I’m sure many have before me. I knock but there’s no answer. She’s fast asleep. There were days when I rearranged my entire schedule for her. Mornings when I would see everyone else first, putting her off until the very end, just to give her a couple more minutes of sleep. I didn’t tell her this; I didn’t tell anyone this. I don’t even think it made any difference, that extra bit of peace before the revolving door of house staff started up for the day, everyone eager to get their licks in. I wish I could say I did it for her—a bit of empathy between the sleep-deprived—but in all honestly I did it for myself, for the moments I passed by her room blissfully undisturbed and woke up a decade and a half ago in the dark of my own bedroom, dimly lit by the stars puddied to the ceiling. And covers up to my chin, there’d be a pair of feet, pausing to eclipse the beam of light beneath my door. My eyes shut eyes, anticipating the abruptness of morning and grasping at sleep, there’d be silence, and then waiting, and then relief, as my father’s footsteps faded into the kitchen and my night was allowed to last one dream longer. You could say that, in a way, I was paying it forward. That in sleep, Ms. Roberts found escape, an out from disease and doctors and her own failing body. But for some reason, thinking back, I’m not so optimistic. I feel like all she ever got were nightmares. I accompany her to the most beautiful room. Unnecessarily spacious with a marble floor that clicks beneath your feet. I can tell she’s nervous. She’s been in enough hospitals to distrust places like this. The nicer the room, the sicker the patient. I can only imagine the palaces she’s seen in her lifetime. Nurses come in and out of huge, oak double doors, carrying equipment and insurance forms, navigating around us the way you do an inconvenient fire hydrant. There is no talking, but plenty is happening. Files are being shuffled. Monitors turn on and off. There is a low hum coming from somewhere. I am waiting, and Ms. Roberts is waiting, too. So we are both waiting, and then it finally occurs to me that this is awkward. I look around and a nurse squeezes by me distractedly and exits through the double doors, leaving us in the polished procedural suite alone. I check my pager, which hasn’t gone off in over a week. Still nothing. She pulls out her phone. We are Adam and Eve and I’ve just taken from the tree of knowledge, a bite into the fruit of social awareness. Ms. Roberts owns a heavily bejeweled Android. Plastic chunks of pink, white, and gold prism the overhead lighting onto her lap. I wonder who she’s texting, whether it’s Andre, the man of mystery who won his place in ink across her chest. Five letters in a cursive flourish, guarding her heart. I don’t think about tattoos very often, but I feel like they suit her. Maybe it’s her personality or she chose just the right ones, but I imagine if I were to have met her without them, without the weaving lines around her right shoulder or the daisy chains around her ankles, I would think something was missing. They seem as natural as a freckle. The same could be said about her nose ring. She gives a deep cough and spits out her lungs into a plastic tray. It fills enough to cover the bottom. Without looking up from her phone she gives it to me and I take it, empty it into the sink, and hand it back to her. We are like that old couple you see through the cafe window each morning. I reach for the arts section of the New York Times and without missing a beat she hands me a pen, even though it’s Thursday, because this late in the week I usually do crossword puzzles in pencil but she’s being coy and cheeky and daring me to take a risk in ink. On the day I see the family for the first time, she’s asleep in a glass room. It’s immaculate. Her bed is surrounded by IV bags strung like bunting, pushing all types of elixirs into her veins. A plastic tube hangs out of the corner of her mouth, and her chest rises and falls in perfect synchrony with a nearby whirring. She has the corner room, which is the biggest one in the ICU, but it overflows with people. A young man stands outside her room, waiting his turn. He’s wearing an oversized Chicago Bulls jersey, the red taurus tinted yellow through the disposable gown. His eyes are misty and swollen. I’m ashamed to say that I never actually met her family. Never said a word to them. Not that I didn’t have the opportunity. I was standing literally twenty feet away from them, but she was sick and I was not, and that disparity felt like infinity to me. For what seemed like too long, I just watched as they stood around her bed, communicating gestures of sympathy and concern. They all had on the same gowns, the same purple gloves and cornmeal masks. The same things that I wore. I was frozen, held to the floor that was polished so well I could see my own reflection in it. And in my image, watching my own gawking, my own voyeuristic spying, I saw who I was and who I was not. The few, tenuous strands holding us together and all of the gaping chasms between, keeping us apart. I turn to leave and I think I see him follow me out, the man waiting outside her room. He caught me staring them, I’m sure of it. I keep my pace down the empty hall. Outside, clouds crowd the sky and threaten to downpour. I hear his steps behind me, the rubber impact of red and black Nikes, and I think maybe he’s catching up to me. Andre’s catching up to me. He doesn’t look like how I imagined him. There’s impatience in his steps because he wants to talk to me, needs to talk to me, needs to interrogate me about these past two weeks, about all of the conversations we had and awkward moments of silence we endured together. Every question I asked her and every answer she gave me and every secret she kept to herself, far away from either of us. He wants them back. They don’t belong to me. Was she lonely. Was she happy. Who sat by her bed at night. Is this how she looked when I woke her up every morning. He wants them all back. What is my name, and which tattoo am I. He rushes toward me as I reach the stairwell. His fingertips graze my sleeve. I forget how quiet the hospital can be at times. Peaceful almost. On Sundays even sickness sabbaths. Just an errant draft and the echo of my footsteps behind me. The windows shudder and blur as it begins to rain.